Home Affairs minister Steven Kampyongo has disclosed that Zambia has started the process of issuing electronic passports to easy the movement of people in the SADC region. 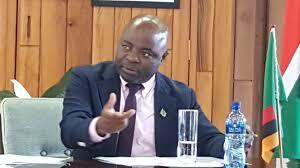 Kampyongo said Zambia has so far engaged South Africa to formulate frameworks that would allow authorities to easily facilitate the movement of people and goods between the two countries. Speaking in Pretoria recently, Kampyongo said preparatory engagements between the two countries to start issuing electronic passports follow the establishment of a bi-national commission which was recently signed by President Edgar Lungu and his South African counterpart, Cyril Ramaphosa. “A memorandum of understanding is expected to be signed soon once the consultation process is finalized. The modernisation of civil rights registration and electronic passports will spur development in the SADC region as skills transfer among countries will easily be facilitated especially among the youth,” said Kampyongo. He has since called on Zambians living in South Africa who do not have adequate immigration documents to legalise their stay in that country in order to avoid inconveniences.